So I’m about to break my own rules that I just laid out yesterday. Seriously, you can’t trust me. Ever. Apparently. Or so they say. I guess, mostly, it’s just that Vegan MoFo is really starting to catch up to me. September is usually one of the crazier months of the year for me (October was always more laid back–casting my vote for October MoFos again if anyone is taking note!!) and this one is no exception. I feel like I’m running on beyond empty. But I won’t give up. It’s not my 6th year of Vegan MoFo for nothing you guys! Which is why, at the end of a long day when I felt like I had nothing left in me to give, I decided to make a multi component dish past 6 pm when I knew the sun would be setting much sooner than later. Thinking things through? Nah, not something I’m super good at. But, nachos, you guys, nachos! Nachos are worth all the effort in the world, right?! Which is why I cooked like I was on Chopped or Top Chef or whatever with the whole world watching and the clock counting down and then I ran outside to the place with the most natural light which happened to be, at 7:30 pm, the middle of the sidewalk. Hey, ya’ll, look at me photographing food in the middle of your walkway. How ya doin? Oh, and speaking of Top Chef–anyone watching Top Chef Masters this season? Bryan Voltaggio is on which is super fun and I’ve been generally loving the group of contestants but I take serious offense at what happened last week (or the week before? Recently, whatever). They were asked to make a plate of nachos for their Quickfire Challenge and almost every single chef said, “ugh, gross, I never eat nachos” or “sigh, nachos are just the worst. The WORST.” And then I quietly cried on my couch and dreamed of liquid cheese and chips. Like let’s have a serious conversation here. Who on this beautiful green planet doesn’t like an oozing, goozing over-topped plate of nachos? If you’re that person, I’m sorry, I just don’t think we can be friends. 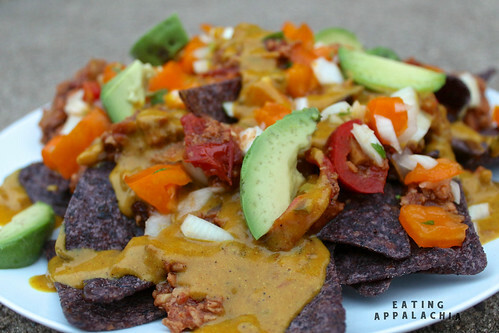 Which is why, on this Friday, I’m breaking my rule about posting recipes from the same person/blog twice during MoFo so that I can talk to you about the gloriousness that is Ball Park Nachos. Ball Park Nachos come to us from the wonderful world of Serious Eats and feature a spicy, tomatoey picadillo and cheese sauce atop some taco chips. Pickled jalapenos, sour cream, and a traditional pico de gallo are certainly welcome. It’s not that there was anything particularly different about these nachos that drew me to them other than the fact that I love nachos and I was dying for an excuse to make some. Plus, football. It’s football season. And I care infinitely more about my team (Atlanta Falcons! Rise Up!) than I do about football eats, but I know I might be in the minority on that one, so, here you go, awesome football eats! I’m totally digging the picadillo from this recipe (TVP subbed for beef) and if you have any leftover from the chiles en nogada, that’d be more than awesome (the flavor profile is very similar). For the queso, I used A Beach Home Companion’s Vegan Queso and absolutely fell in love with it. It’s simple and not too noochy with just the right kick from the salsa. Finishing off the giant plate of awesomeness are some sliced avocados and fresh pico de gallo with garden tomatoes and parsley (I’m not a cilantro fan…I know, I know). All in all, an epic, amazing, I’ll make it again anytime plate of vegan nachos. Oh, and word to those serving to omni friends, while each of the parts of the nachos–the queso and the picadillo–won’t individually trick anyone into thinking that they’re eating “regular” nachos, G & my consensus was that when all put together, these nachos actually taste non-vegan. I don’t get it, but they do. And I love it. So don’t shy away from serving these to omni folks–they’re awesome!! Soak the raisins in water for 20 minutes to plump. If using fresh tomatoes, reserve 1 c raisin water and drain the rest. If using canned tomatoes, drain all the water. Place the TVP and the 1 1/4 cup water in a small pot and bring to a boil. As soon as it comes to a boil, remove from heat and let sit 10 minutes to rehydrate. In a large skillet over medium heat, warm the oil and add the TVP to the pan. Cook for 1-3 minutes, until the remaining water has cooked off of the TVP. Stir in the diced tomatoes with their juices and the chili powder, cinnamon, cumin, and salt. If using fresh tomatoes, add the reserved raisin water. Add the garlic, onion, and peppers. Cook until the vegetables are tender and all of the liquid has cooked off, about 15 minutes. Stir in the drained raisins and lime juice. In a saucepan, combine the dry ingredients. Whisk in water and turn on heat to medium-low. Whisk constantly until the sauce is thickened, about 4-6 minutes. Remove from heat and add margarine until melted. Stir in salsa. In a large bowl, combine the tomatoes, onion, jalapeño, and garlic. Fold the chopped cilantro into the mixture. Add the lime juice and season the pico de gallo with salt to taste. Layer tortilla chips on a large tray or serving plate. Top with picadillo, queso, and pico de gallo. Add avocados, pickled jalapenos, vegan sour cream–you name it. Serves 8 very hungry people. Raisins in a picadillo, huh? I’ll trust you – there’s plenty of other stuff on that plate too. I’m a fan of nachos but never seem to do them up well enough. This looks like a full meal, for sure, and waayyyyy better than anything I’d ever find at the ballpark. So if I start taking my walks by your house in the evening, and you’re out on the sidewalk photographing your latest dish – do I get a taste??? September is very busy for most of us and I will second the October mofo for next year even though I didn’t do it this year. 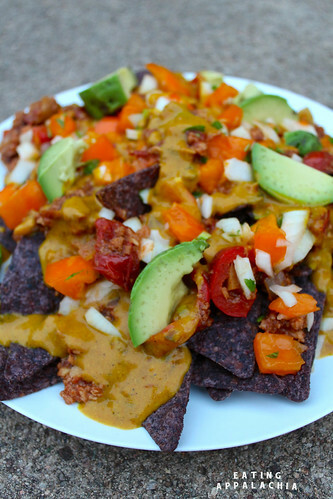 Your nachos look really good. I usually do a grilled veggie nacho to get more veggies in and friends and family love it! NACHOS! Everyone loves nachos. I bet even all the Top Chef contestants secretly eat chips and cheese on occasion. Maybe they don’t call it a nacho, but IT IS. Also: raisins? That is definitely something I’ve never had in a nacho! Super interesting. Never trust a person who doesn’t like nachos. That person HAS NO SOUL. It’s your blog so you can break your own rules!! Totally worth it for these nachos, they look like a fantastic meal!